HangingTogether is a place where some of the staff at RLG, a membership organization of libraries, archives, and museums, can talk about the intersections we see happening between these three different types of institutions. We travel to our members a lot and go to conferences and wanted to be able to take note of the interesting things we see along the way. Stop in, stay awhile, and hang out. On the Museums/Computers list, there has been a vigorous discussion about folksonomies and Günter Waibel has done an excellent job of summarizing it. 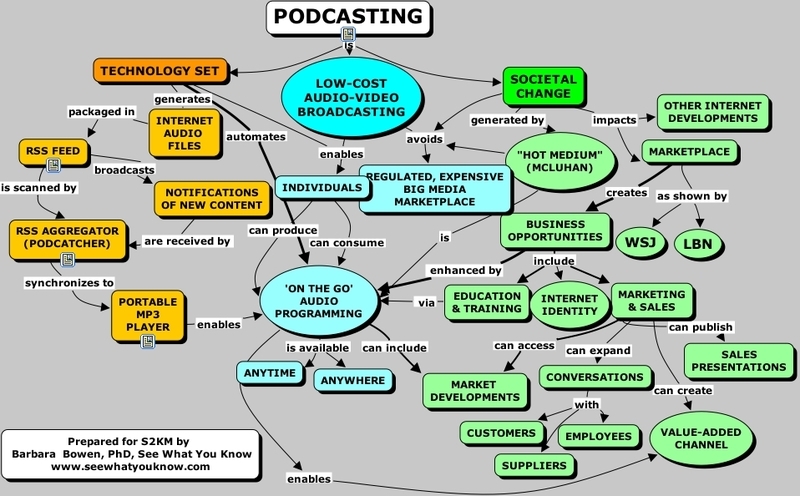 Here's a podcasting concept map from Barbara Bowen found it from Nancy White. Hmm .. I need to create vlog concept map. 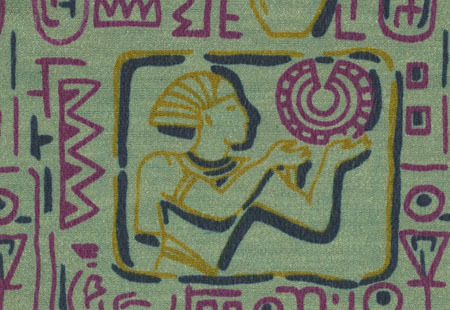 "The swatchbook has a lot of high resolution public domain (in Aust) fabric swatches available for download. Unfortunately, as they come from a series of physical fabric swatchbooks they have been catalogued by the Museum as three separate books. Each book contains numerous swatches, all of which are unlabelled. We have, since the launch, been inviting users to describe the swatches. As these descriptions are added by users of the site they go into a database as search terms alongside the particular swatch record. Once we have a critical mass of descriptors then we will turn on searching which will enable searching by colour and pattern etc." I'm fighting the temptation to want to create a digital bloggers quilt .... grab a fabric patch, write a post, and stitch it together with a technorati tag like "digital.quilt"
This project is one of several where museums experimenting with folksonomies. The Art Museum Community Cataloging Project is another experiment of how social tagging of art may make it more accessible to the general public. The project uses a tool named, STEVE, an open-source tool for enabling social tagging of museum object images to create folksonomies. Popular Internet applications that take advantage of social tagging – think flickr and del.icio.us – have captured our collective imagination over the past year. Museums could learn from these developments, and use folksonomic classification both to improve access to on-line collections and to provide the foundation for community-based services that reinforce the role of the museum. On most mornings, I try to get my exercise done in the morning, a five mile run or spinning. Just so it doesn't get boring, I take my Ipod along and listen to music or podcasts. This morning I missed out on my run, but this week's show over at 501c3Cast - Podcast for Nonprofits, a weekly podcast show of interviews and news about Nonprofit volunteers, do-gooders, and professionals, had arrived and I simply could not wait until tommorrow. Why? I've said this before and I'll say it again ... Corey Pudhorodsky, the and brains behind the program, is the Terry Gross of the nonprofit podcasting world. He asks great questions and has a great "FM radio ," not to mention a good sense of humor. His show is a reason why every nonprofit should have an Ipod (or at least aggressively drop their business cards into raffles to win one!) and figure out how to subscribe to podcasts. (And, oh yeah, he interviewed me ...) The show list is here. Can anyone recommend one of the gizmos that allows you plug your Ipod into your car radio? 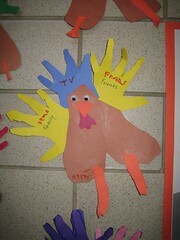 The Reddit Alien is ready for Thanksgiving! Here's more about Reddit. Annalee Newitz and Charlie Anders are editing an anthology of essays titled "She is Such a Geek," an Anthology by and for Women Obsessed with Computers, Science, Comic Books, Gaming, Spaceships, and Revolution. They are looking for submissions of essays. Here are the details on how to submit your essay. 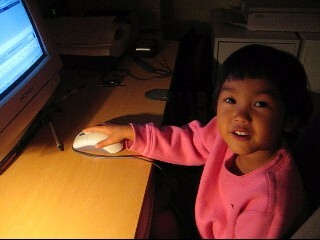 My daughter is 4 and in her pre-school is a computer. I've been lingering a little at drop off to observe how she interacts with her peers at the computer. It struck me how gender inequities start an early age. I thought that with some intervention we might avoid some problems for my daughter down the road should she wish to pursue technology. Harry's first baby tooth is loose. It has been loose for about ten days now. It hasn't yet fallen out. To honor this rite of passage, we created one-minute documentary about loosing your baby teeth in Cambodia and America. Wanna, a Cambodian blogger, contributed to the sound files of the phrase "tooth" in Khmer. I'm nervous. This is my first toothfairy assignment. 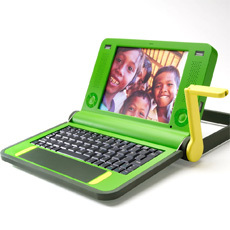 Meanwhile, this year's holiday gift and for four more years .. will be to sponsor a young woman's college education in Cambodia. This will be done via the Sharing Foundation (disclosure: I'm a board member). I'll post more details later. From a post on Global s, Rebecca MacKinnon writes "These guys are basically the dream geek team for free speech on line. They gave instructions in detail about how non-governmental organizations, human rights groups, and individuals trying to speak the truth under dangerous circumstances can secure their communications and data, and minimize the likelihood that people will get caught or arrested as a result of their work." This is very important work they area doing, particularly for bloggers in countries like Cambodia. I'm also wondering who are the women doing this work? Lisa Stone's recent post on the Blogher Blog, "True or False: Do "women warm the podcast bench?" responds to Steve Friess' report for Wired News on the lack of a presence of women at the Portable Media Expo and Podcasting Conference. What worries me is that just because women didn't show up on that radar at podcasting's inaugural conference doesn't mean we aren't podcasting. It means the guys at that conference don't know us. And Friess cannot report what he doesn't hear or doesn't know. It isn't only podcasting, it happened at hackers conference, according to the annecdote that Annalee Newitz mentioned in her talk "Revenge of the Female Nerds: Myth Busting." Lisa points to Amy Gahran's Women in Podcasting: The List and encourages us to add to that list. So, be sure to leave a comment in Lisa's post if you are warming the podcasting bench. Marnie Webb asks "Why don’t we think mistakes are a part of excellence? I think in our culture we tend to view someone who has made a mistake as being "dumb." Maybe it has something to do with our upbringing or our educational experience. We were not taught at an early age that "reflection" is a good thing, let alone how to do it. The message was that a mistake is an opportunity for shame, not an opportunity to reflect on how to do something better. I'm hoping schools are different these days. My son's school is. 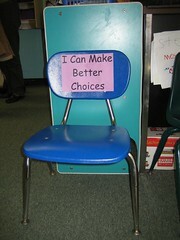 His kindergarten classroom has something called the "I can make better choices chair." The kids sit in it and think about what they did and how they could do it better. It isn't a punishment or timeout chair, they are just trying to teach the kids to be reflective and that our "mistakes" are good learning moments. I've been looking for some how-to guides for mini-documentaries that would cover some of the asethetics, planning, and process as well as the technical parts. I came across the FourDocs Guides via Nonprofit Online News. A lot of what is here could be adapted for vlogging if you wanted to create "vlogumentaries." I loved the "Start Thinking" guide that teaches how to structure, subject, and style. Are Mistakes A Bad Thing? I stumbled upon that logo today ....and it was actually the third click in a row that where I saw the word "mistake." Last night Corey asked me a great question. "What a mantra that you often say to motivate yourself?" I've always said, "Mistakes are our best teachers." Many times people become mistake phobic and a mistake becomes a point of shame. That's too bad because "mistakes" offer us a chance for reflection and improvement. Then the last place I saw the word was on Root.Net, in the "About" section where it explains their values. Here it is: Failure Friendly - Failure is a phase of success. Always make new mistakes. By the way, Root Vaults is a new Attention Trust approved service. (See here) I opened a vault and it isn't a mistake. What I like about it is offers some of the features for analysis of your data. This feature enables you to do what is also stated as one of Roots values: Be secure in the value of data. Data tells stories; listen and share them with others. This is my "virtual" colleague Joistke Hulsebosch. We've never met face-to-face, but we have many similar interests. We "met" when we both took the incredible Nancy White's Online Facilitation Workshop. In addition to the workshop curriculum, we were encouraged to explore our own inquiry questions. Mine included: How can blogs play a role in online community building? How can one integrate audio/podcasting and video logging into online conversation effectively? Joistke and I had lots of sandbox time together, along with other participants, that enabled to play with audio (and video) as online conversation. She is fearless, brilliant, and asks great questions. Along the way, she asked about blogging and I encouraged her to try it. I pointed her to some how-tos and the next thing I know there is this fabulous blog called "Communities of practice for development." I want to track the materials I found and my reflections on this topic without having the pretention that it will be exhaustive about everything happening in the field of communities of practice for development. My three main streams are practical examples, culture and technology. I'm also a paper artist. I create art with paper. My tools include pens, ink, rivets, glue, ribbon, and many other objects. I explore techniques as diverse as orgami to stamping. As people who know me well, greeting cards are always handmade. I've also played with the idea of computer arts & crafts -- integrating digital and handmade art. For example, using a rubber stamp to create an image, scan it, and manipulate it and then use it as part of a paper collage. I've also used computer arts & crafts ideas when I volunteered as a computer mentor at the computer kids clubs (a long time ago). I also hope to share some of those projects with my own kids. So I just had to blog these computer paper arts & crafts! 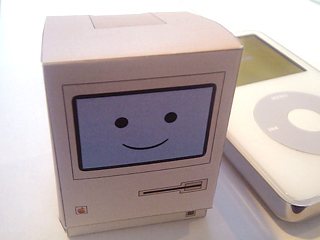 Here's the pdf you can print out and use to create the 128 Mac. And while on the topic of nonprofit podcasting, the thread on TechSoup has a great post by Eric Williams from the Walker New Media Initiative. I'm a big fan of the Walker's experimentation with blogs, wikis, and podcasting. Eric posted some excellent thoughts on the problem that Cambodian bloggers have to get past - podcasting without electricity. Since I can't point to the specific post in the thread, I'm excerpting here. We have a couple of projects going on at the Walker Art Center that are audio based. We started off wanting to make audio tours freely available to all of our patrons and we were unhappy with most of our commercial options. We were also concerned that if we used podcasts we would either limit ourselves to patrons who had iPods and who planned ahead to load the files or we would have stock the audio players ourselves. Stocking the players would mean we would have staff overhead/expense of checking ipods out keeping them updated not to mention the expense of buying the ipods. So we opted for cell phones. In some ways this may help with your question about podcasting without electricity. Of course that's an extreme you can't play any audio with out electricity or batteries but cell phones are one of the worlds most ubiquitous technologies. Although most people in the world do not have cell phones I think it's safe to say that generally people will have access to a cell phone years before they will get access to an ipod+computer+high speed internet. Of course there is not a cell-casting movement and listening to your cell phone for long periods of time without talking could seem strange with out a headset but there could be some potential there especially with the adoption of faster cell service by many countries. And after we saw how popular podcasting was getting we packaged the same audio up as podcast (on that same page). We are hoping that offering the content up to multiple playing devices will help get it heard more. Also we've been using podcasts with some success on mnartists.org just by making and "audio only" feed in our existing RSS implementation. This is a pilot of a larger concept for the site but there is a sponsored project on the site called Radio mnartists that was a good opportunity for a podcast because it offered regularly updated audio content. We implemented the same RSS/podcast feeds for individual artists on mnartists.org but have had a very limited adoption of that so far. Eric: I have a question for you. Do you know why there is limited adoption? Last night I had a wonderful conversation with Corey Pudhorodsky who is the and brains behind 501c3Cast - Podcast for Nonprofits, a weekly podcast show of interviews and news about Nonprofit volunteers, do-gooders, and professionals. Corey Pudhorodsky is the Terry Gross of the nonprofit podcasting world. He asked great questions and a great "FM radio ," not to mention a good sense of humor. His show is a reason why every nonprofit should have an Ipod (or at least aggressively drop their business cards into raffles to win one!). The show list is here. Since I dabbled a bit in podcasting before I plunged into vlogging, I got to pick his brains on his techniques, process, and tools. He spends a lot of time researching the Web to find ideas for stories and then will has a formal list of questions he uses that he makes available in advance. As the interview progresses, he is making notes on paper about the juicy segments, etc. He makes the call via SKPE and uses a cheap plugin called "hotrecorder" that tapes the call. After the interview, he divides each question into a different track and then edits in audacity. He, like me, prefers free or open source tools and admits that Audacity did have a learning curve and it can be conquered. He also edits out "ums" and other distracting noises. So the interview isn't a verbaitem copy -- it is produced. One thing I suggested to Corey is that might consider doing what nerd.tv does with their video interviews. You can either download the whole interview, just the "juicy" parts, or just the "nerdy" parts. One of the things I learned in my experimenting with online audio conversations with others who work in the npo sector is that any way we can make things scannable and quick to listsen to is good. So, downloading and listening to a snippet might be a good scaffold. 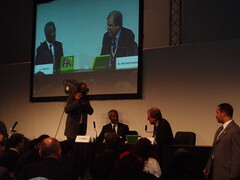 Here's a photo from WSIS flickr stream. A comment mentions this: " A slightly embarrassed Mr Annan inadvertently broke the crank handle of the non-functioning model on display as he left" from this news story. Andy Carvin, who is doing an incredible job of reporting from WSIS, made a 8 minute documentary. Here's the google news stream that captures the news articles mostly from the mainstream media about this product. Here are some links from various listserv discussions and blog posts when the laptop was announced here in Boston last month. Here's the press photo via a post on netsquared. First Mommy Bloggers, Now Mommy Casters! I met some of the "Mommybloggers" at blogher and more recently they launched a site called, what else, Mommybloggers. The goal "is to expose the diversity of the writers who commonly fall under the label "mommyblogger .... We will feature women who will share how their experiences in motherhood effect the many various aspects of her life in humorous, supportive and informative ways." I just read an article in Wired about Mommy podcasters and a new site called, what else, Mommycast. Laura Quinn has published "Donate Now: Selecting an Online Donation Tool." The report walks through the available software tools to accept credit card donations from an existing website, with considerations, guidelines for choosing, recommended vendors, and detailed reviews of nineteen different tools. A call to all geeks: start new memes! Ones that destroy myths that split women into “types.” Annalee Newitz says geek networking—among women and men—is the answer. All will become clear when you visit Beth's Blog and read her liveblogging notes to Newitz’s talk, “Revenge of the Female Nerds: Myth Busting.” Nice bit of video at the beginning as well. 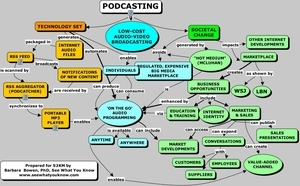 Hot Topic on TechSoup: Do you podcast? Have you ever listened to a podcast? Do you broadcast one? Do you think it's a good way to distribute content to the masses? Want to talk about nonprofits and podcasting? Head over to the TechSoup Forum.